The corporate merger of Amazon and your corporeal body has been frustratingly slow so far, as the company teasingly draws out its incursion into your home, TV, car, clothes, food, and minds through cautious dribs and drabs. But more recently, a free Prime Two-Day Shipping seems to have been applied to the moment when you and Amazon will at last become one: First, it announced that it would take over the mailrooms of thousands of apartment buildings, setting up Amazon lockers for those lucky residents in which they could find their daily Amazon manna gifted from the Amazon heavens. And now even those who live, for now, in non-Amazon homes can just give Amazon a key to their front door, so Amazon can just walk right inside. At last, no more of these pesky walls between you and Amazon. For just $250, the new Amazon Key package will allow Amazon couriers to access your Amazon Cloud Cam, the indoor home security device that allows you and Amazon to see inside your house at all times, to ensure that you’re safe, secure, and don’t need a fresh shipment of DVDs. 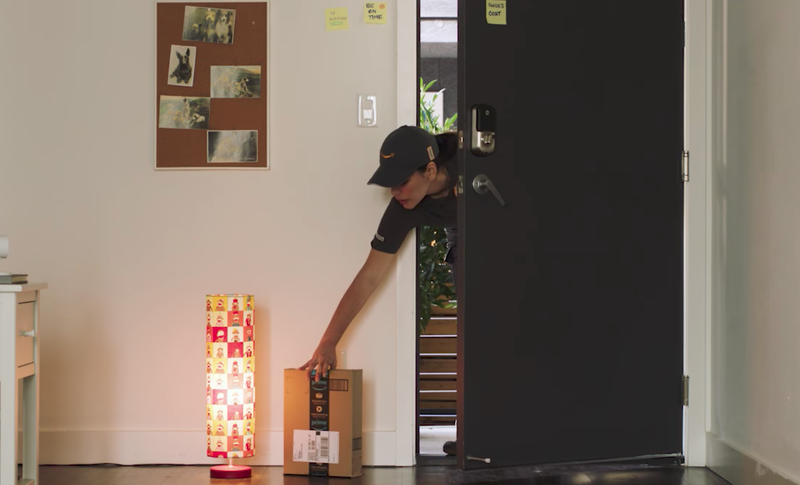 After the courier scans the barcode on your Amazon package into the Amazon cloud, it then sends back a signal to your Amazon Cloud Cam, which in turn communicates with a compatible smart lock—also available through Amazon—that opens your door, allowing the courier to place the package safely inside. The camera then records the entire process to ensure that nothing out of the ordinary happens while you’re allowing this mega-corporation to control who can enter—or leave!—your home. Unfortunately, the service is currently only available in the 37 U.S. cities where Amazon deliveries are handled by its own service team, although Amazon does plan to expand that in the future, once all things everywhere are handled by Amazon’s service teams. And while there are sure to be some luddites who balk at the idea of allowing Amazon to monitor their homes 24/7 and lord over who can and cannot access it—depending on the permissions you grant, of course, provided you also remain a model Amazon citizen—isn’t sacrificing a little bit of privacy and sovereignty over your own property and body a reasonable price to pay for making sure your Amazon packages are delivered? You have 30 seconds to respond in the affirmative before Amazon Key revokes your access code.